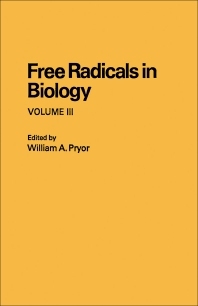 Free Radicals in Biology, Volume III reviews diverse topics in free radical biology and relates the results of chemical and biochemical investigations to clinical situations. It attempts to bridge the gap between chemical investigations and the medical applications and implications of free radical reactions. Topics covered range from radiation chemistry to biochemistry, biology, and medicine. Comprised of seven chapters, this volume begins with a general introduction to the technique of radiation chemistry; the thermodynamics and kinetic factors that need be considered; the use of pulse radiolysis and flow techniques; and the application of these methods to free radicals of biological interest. The reader is then introduced to the pulse radiolysis method and the mechanisms of carbon tetrachloride toxicity. Subsequent chapters discuss the morphological, histochemical, biochemical, and chemical nature of lipofuscin pigments; production of free radicals from the reactions of selected enzymes with their substrates; and the damage caused to skin by sunlight. The final chapter deals with the involvement of free radicals in chemical carcinogenesis. This monograph will be of value to chemists, biologists, and physicians.